This French Toast Granola has all the flavours of a traditional French Toast breakfast. Incredibly easy to make, requires only 9 ingredients and packed with mega crunchy clusters. Can be used as a topping for yogurt bowls, smoothie bowls and more! It's been awhile (and a little too long) since my last granola recipe but after digging up an old bag of this granola I found in the back of my pantry, it reminded me how dang delicious granola is. I finished the bag so quick and I wanted more! It was time to make some more homemade granola. All the ingredients get mixed into a large bowl and then patted down onto a baking tray. That goes into the oven for a total time for around 20 minutes! The hardest part is waiting for it to cool so you can create your granola clusters. Making homemade granola is so easy, cheap and can be much healthier than the store bought stuff! You get to control what goes into your granola and play around with the ingredients, as long as the wet to dry ratios are the same. 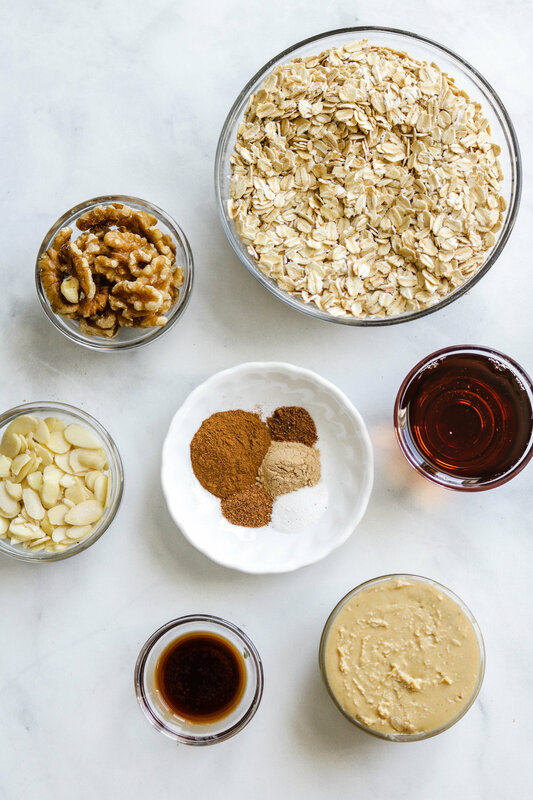 To make good granola, you need to start with the right ingredients! Time after time, I always come back to this granola by Bob’s Red Mill. Trust me, it makes a difference! It yields this crispy-perfect-granola texture that other oats have not done for me. If you LOVE clusters, you need to pat down your granola mixture to create the clusters. Don’t shuffle the granola like most recipes tell you to, just let it be and my next step will ensure your granola does not burn. Begin with a low temp to allow even cooking and so that the nuts do not burn. Cranking up the heat the last couple of minutes will produce colour on the granola and create that crispy texture. Cashew butter can be replaced with any nut butter, but it will change the taste! Although, I do think peanut butter is actually quite good in this recipe :). If you recreate this French Toast Granola recipe please share it and let me know what you think by tagging me on Instagram @lisakitahara, I love seeing all of your tasty recreations! Easy Homemade French Toast Granola with tons of clusters and flavour. Vegan, gluten free, oil free and made with only 10 plant based ingredients! In a large bowl, mix the maple syrup, cashew butter, vanilla extract and all the spices together until well combined. Add in the rolled oats, chopped walnuts and sliced almonds, then mix until everything is well combined and all of the dry ingredients are evenly coated. Transfer mixture to a lined baking tray and spread it evenly using a spatula. Place the tray into the oven and allow it to bake for 12 minutes. Then, increase the heat to 350F and allow it to bake for an additional 8-10 minutes, or until the granola looks golden brown. Allow the granola to completely cool. Then, using your hands break the large clusters into desired size pieces. Store in a air tight container or use right away and enjoy!